Clore Automotive, founded in 2001, design, develop and manufacture a large range of motoring devices, including an industry renowned clore jump starter range. Although the company is relatively young they have a vast heritage in the motoring industry, reaching back over 50 years. This heritage and the vast insight it provides has been vital to their success in recent years, with nine separate brand names all of which are leaders in their respective markets. 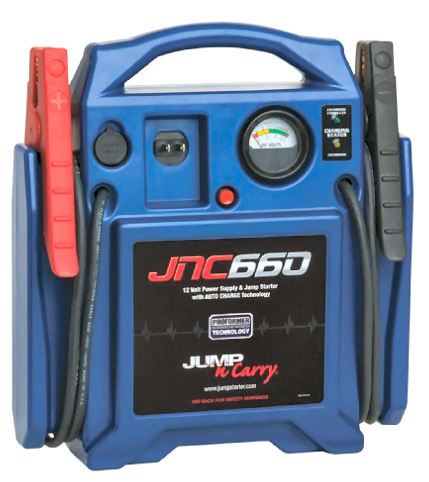 One of Clore Automotive’s most success brands, the Jump-N-Carry, produces a range of 8 jump starters. The brand has a reputation for being both efficient and reliable, with peak amperage ranging from 770 amps to 3400 amps the Jump-N-Carry brand is exceedingly diverse. Clore Automotive are well known in the market for constantly improving their jump starter battery technology to meet the evolving power needs of both professional and non-professional consumers. Other Clore brand names include Booster PAC, SOLAR, Christie, VIPER and T-TECH. Clore Automotive pride themselves on the constant innovation they bring to the automotive after market. This innovation is seen in the continuous development of their proprietary battery technology which is used across all of their brands, including the Jump-N-Carry jump starter range. The technology utilized by their products is specifically designed for use in vehicle jump starting, optimising their products starting power and durability. Clore Automotive produce eight jump starters in their Jump-N-Carry brand, with amperage ranging from 770 amps to 3400 amps. With two of their products, the JNC600 and JNC300XL, featuring in our Top 3 Lead Acid Jump Starters Clore’s reputation in the automotive after market is well warranted. Read our Clore JNC660 jump starter review (their market leading best seller), or check current deals here. Read our review on their best selling, 900 peak amps jump starter, the Clore JNC300XL jump starter, or check current deals here.